We are excited to let you know about a great program we have for volleyball beginners called PowerPlay! 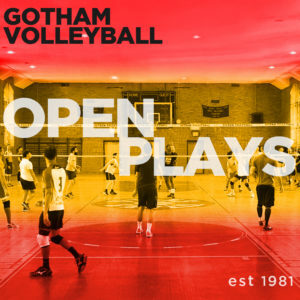 It’s a Gotham division just for beginners that also includes volleyball coaching from our Power coaches to help you learn the fundamentals of the game and introductions from Gotham leaders to welcome you to Gotham. PowerPlay is designed for beginning level players new to Gotham, but we will also welcome Gotham returners who want to play at the beginner level and want to focus on fundamentals. PowerPlay will be both your Division and Power class for the season in one three-hour session per week. Each week, on Sunday afternoons at 1:45 PM, you’ll come to practice before playing your match or ref your match (which will start at 3 or 4 PM). Here’s the exciting part — your practice will include help with volleyball fundamentals and be coached by our Power Training staff. After practice, you and your team will play your match, and then go hang out afterward. We’ll also help introduce you to the other parts of Gotham traditions, social and community activities. Like all of our divisions, you’ll play for a full 12-week season, and then have an End of Season Tournament. The cost for the season of PowerPlay, which includes the Gotham coaching, a full season of Division play, the tournament, and everything else you’d get as a member of Gotham is $195 for the season. How to join: If you are new to Gotham and volleyball, and want to play in our PowerPlay division for beginners who want to learn the fundamentals, register for PowerPlay (we also suggest that you try out for Divisions 9 & 10 as well). Then, come to tryouts on the day scheduled for Division 9, 10, and PowerPlay. If you have any questions, please e-mail [email protected]. Dues are $195 for the season.